In today's sourcing world, there are a number of directories that can assist in finding suppliers who offer specific services. But even with this information at your fingertips, there is still some more leg work required to find the supplier, or suppliers, who are best fit for a project's needs. During this pre-screening process, it's crucial to understand the criteria categories for the project, to identify these ideal candidates early on. The best way to achieve this information is to conduct a verbal RFI to discover which potential suppliers are the best candidates to invite to a sourcing event. 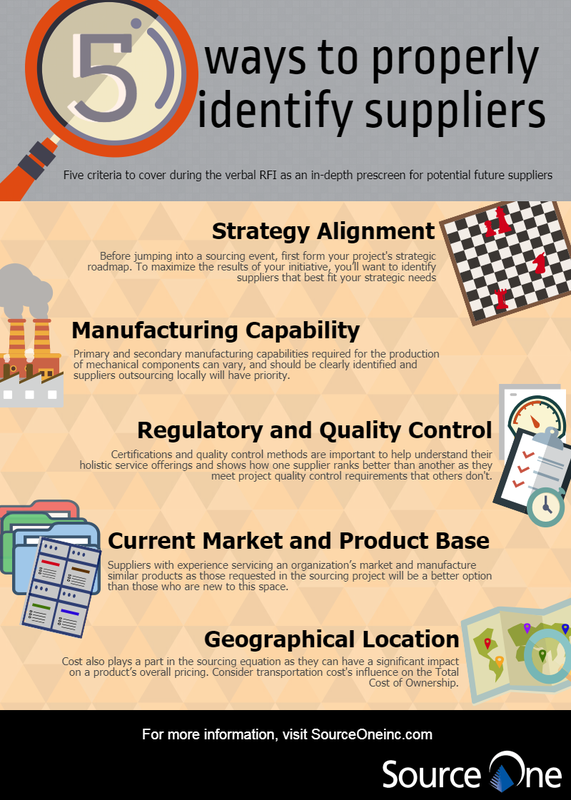 Check out our latest infographic, 5 Ways to Properly Identify Suppliers, to find out which criteria categories to consider during this process. Source One offers sourcing and procurement services to support your organization in every stage of both the RFP and RFI processes. Our team of experienced consulting professionals have the market intelligence necessary for conducting, managing and responding to these documents in processes that allow the organization to make the best decisions for your business.